We often come to this local restaurant, which offers a fine range of Indian and Asian fusion dishes on it’s grand buffet downstairs. Tricky to illustrate, though, due to the similar colour palette throughout. This necessitates concentrating on shading to create form. Trying to use variations in the paint depth to create form. It’s certainly an interesting exercise in shape and tonal work. Don’t get me even started on rice! Here, I’ve drawn in some of the more prominent individual grains. Shaded in the main darker areas within the rice structure. I used paint to illustrate some more of the grains. Finally I use paint spatter over that area to add a small random element of paint to the rice structure. 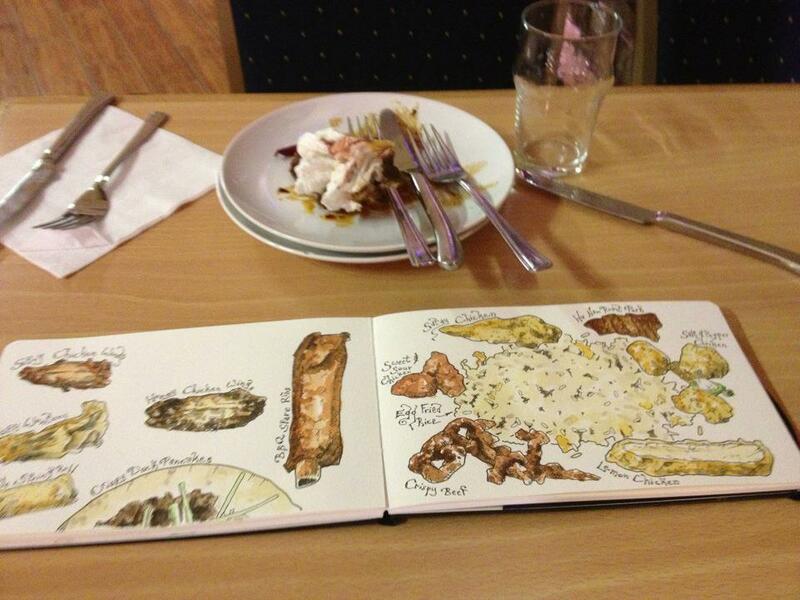 One of our favourite places to eat out at in Huddersfeield was Jumbo’s Chinese Buffet. I think it was because when Lucy was quite little she was rather partial to prawn toast (or crawn toast as she called it then). It meant that Caroline and I could have a relatively good meal out and feed Lucy up too. I hasten to add that she did eat other things too! But Jumbo’s closed down several months ago. Just imagine our delight to discover that another Chinese Buffet had opened to fill it’s gap. I didn’t scoff my way through piles and piles of buffet to achieve my drawing; instead I have to report that I just had lots of VERY small portions of dishes! Okay, I’ll come clean! I had a larger serving of the Satay Chicken, but only because it was really tasty and I wanted some more … and it was an all-you-can-eat-buffet. After popping into the Art Gallery in Bradford, after work, I thought I would sample one of the newer oriental buffets. The range of dishes was a bit limited and, as I sadly wrote at the time, a large group came in shortly after I arrived and finished off the whole of the crispy duck, leaving just a smear of hoisin and a trail of pancakes in their wake.